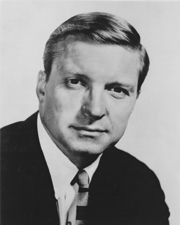 PERCY, Charles Harting, (father-in-law of John D. [Jay] Rockefeller IV), a Senator from Illinois; born in Pensacola, Escambia County, Fla., September 27, 1919; attended public schools in Chicago and Winnetka, Ill.; graduated from the University of Chicago in 1941; joined the company of Bell & Howell; during the Second World War enlisted in the United States Navy in 1943 as an apprentice seaman and was honorably discharged in 1945 with the rank of lieutenant; after the war, rejoined the company of Bell & Howell, eventually becoming president, chief executive officer, and chairman of the board; appointed as President Dwight Eisenhowers personal representative to presidential inaugurations in Peru and Bolivia with rank of special ambassador 1956; unsuccessful candidate for governor of Illinois in 1964; elected as a Republican to the United States Senate in 1966; reelected in 1972 and 1978 and served from January 3, 1967, until January 3, 1985; unsuccessful candidate for reelection in 1984; chairman, Committee on Foreign Relations (Ninety-seventh and Ninety-eighth Congresses); president, Charles Percy and Associates, Inc.; served on the boards of several foundations and committees; was a resident of Washington, D.C., until his death on September 17, 2011. Hartley, Robert. Charles H. Percy: A Political Perspective. Chicago: Rand-McNally, 1975; Murray, David. Charles Percy of Illinois. New York: Harper and Row, 1968.